I look back on the weekend with withdrawal symptoms wishing I was still there. It’s been a while since I have had such a great weekend of flying, fun and camaraderie. The Cup weekend event run by the MMAC at Cobram has been slowly building over the past few years, and this year, it’s fourth was by far the biggest and most impressive. For a few, the weekend started a little earlier with Jason Sagaidak (MMAC President) and a couple of others turning up on the Thursday then a few more on Friday. The Cobram weather turned on the usual wonderful conditions right through to Saturday evening. As the hordes arrived during the course of Saturday morning, Jason and Col made final adjustments to their new sponsored club-managed Tow Plane – a 150cc 3 meter Yak 54. And as far as I am aware, it’s the first sponsored club-managed tow plane. The Yak had an unfortunate incident 5 months earlier with a dead stick and wet-ware error. After dissecting the remains, Colin Booth took up the challenge and said “we can rebuild it”. With that enthusiasm, soon the whole club got behind the project and driven by Jason and Col, YaKanTow was rebuilt and ready for duty for the Cup weekend. All of the original parts were donated to the club and shortly thereafter the enthusiasm spread to the sponsors; RC Trader, WorldHobbies and Pro Hobby (who are regular supporters of the club and its events). With the knowledge that Sunday may bring some average weather, people got into it as soon as they could and not long into the morning gliders were flying. As with all their events, the club turned out a fabulous lunch during which Theo Arvanitakis put on a great display of his Tomahawk Futura Aerobatic Jet. Only a mother could love the looks, but the JetCat P180 pushed this through a huge speed range and made for wonderful break from soaring activities. With Lots more flying right through to about 7.30, when the club served up a roast dinner, followed by some night flying. After the carnage, Steve Lunney and Neil Spencer served up the ritual jelly shots. We then settled in for an evening of outdoor soaring videos courtesy of Jim Houdalakis and light entertainment from Jason and co.
Sunday brought some rather windy and difficult conditions that eventually blew the day out. Sunday night we all gathered at the Cobram Hotel for what must be one of the best steaks you can get, and a full evening of debate and analysis. Everyone can be at peace; all problems of the world were solved! Monday we awoke to slightly calmer conditions, but still with a fairly stiff southerly. As is a regular pattern in Cobram, the weather abated towards the afternoon and late afternoon flights were again a pleasure. Tuesday still had a slight southerly but by lunch time it had given way to huge thermal activity and lots of very big sky. We almost saw Gary Mac maiden his scratch built 1/3 scale Minimoa, but it still needed some adjustments before it flew. Nice work Gary. 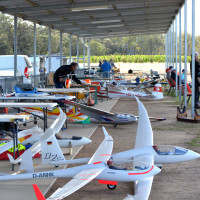 Probably one of the most impressive sights was to see all the new glider pilots from the MMAC get well into towing and with the number of local glider pilots now ten plus, and the club aero-towing almost every weekend, the MMAC must be the most active scale soaring club in Victoria. I would like to thank all the members of the MMAC for welcoming us back again and looking after us so well. It is amazing how such a small club can get together and produce such fabulous facilities. I would like to especially make mention to the people who manned the canteen and cooked the roast dinner. Our thanks to Frank Rettke, Michael Stephens, Glad Stephens, Jim Dykes, Bruce Hobley and Barry Humphries. I would also like to thank the guys who do not fly gliders but came out and helped on the flight line, learned the job and then made it look easy. Our thanks to Bill Scholtes, Garry Bushby and Allan Foster. Now, without these guys, the event will never happen – the tug pilots. They build the models out of their own pockets and make them available for everyone’s benefit. Thanks to Jason Sagaidak, Colin Booth, Theo Arvanitakis, David Hobby, Chris Graham, Daryl Blow, Neil Spencer, Steve Lunney, Rod Watkins and I suppose I should include myself. Finally – A big thanks to Jason Sagaidak. He battled some difficult situations to make the event happen and he has also had the amazing vision to engage with a new discipline and inspire so many in such a short space of time. It is a breath of fresh air to see so many new faces in the Scale Soaring scene. With a final tally of 37 glider pilots, over 80 sailplanes and 12 active tow planes, it has to be one of the largest Victorian events to date, if not for quite some time. Everyone is already looking forward to going back in June for the “Cobram Queens” weekend.